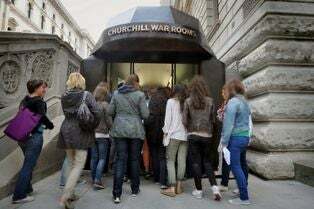 History was made in Churchill War Rooms. 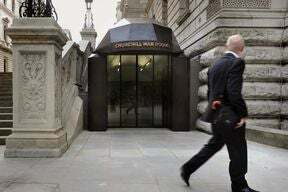 It was here shrouded in secrecy beneath the streets of Westminster that Winston Churchill and his inner circle defied Hitler’s bombs; here that they wrestled with every life and death decision of the Second World War. 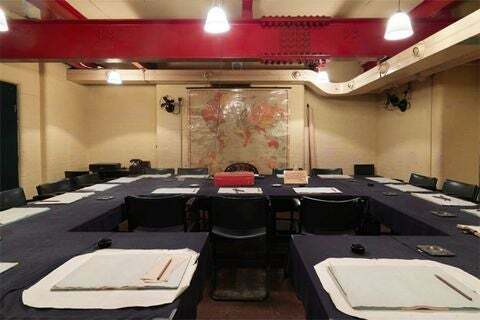 This was the bed Churchill slept in, this the Map Room where he agonised over the latest intelligence reports, these the scratches he gouged into his chair as tension mingled with cigar smoke in the cramped confines of the Cabinet Room. There is no better place to appreciate the defiance, improvisation, camaraderie and awe‐inspiring reality of those darkest hours. Churchill comes to life in extracts from his rousing wartime speeches, as visitors stand on the squares to hear the prolific speeches and phrases from the politician - you’ll hear his famous words ‘Blood, toil, tears and sweat’ and ‘We shall fight them on the beaches’, the words of a leader rallying his country. The audio guide provides insight into Churchill’s Cabinet War Rooms. Featuring highlights for this historic setting, it provides insight into Churchill’s life and the decisions he made which changed the course of history. Audio guides are included in your admission price and you can choose between a variety of languages, (English, French, German, Italian, Spanish, Hebrew, Portuguese and Mandarin), a family guide and a descriptive guide for visitors with visual impairment. If you have a mobility issue, it is recommended that customers make their way to the front entrance via Birdcage Walk by St James Park. Once inside, the historic Churchill War Rooms is wheelchair accessible throughout. Including a lift to the basement level, Mobility accessible toilets, two wheelchairs are available on site for people that may need assistance during their visit. Guide dogs and hearing dogs are welcome. For the hearing impaired, an earpiece is available for the hand held audio guide, or you can obtain a copy of the sound guide transcript. In order to gain entry you must present a printed copy of your voucher. Latecomers may not be accepted onto the tours. Please exchange your e-mail confirmation at the venue to gain entry. Children are aged 5-15yrs. Children under 5 are FREE.